STOVER. STOVER married Della Francine STOVER. Della Francine STOVER was born on 31 Jul 1956 in Conway, Faulkner, Arkansas. Della married STOVER. Walter Gene STOVER was born on 10 Jul 1974 in Morrilton, Conway, Arkansas. Jeremy Lynn STOVER was born on 16 Aug 1976 in Morrilton, Conway, Arkansas. Jay PEEVEY. Jay married Darlene JONES. Darlene JONES [Parents] was born on 25 Oct 1935 in Kenefic, Bryan, Oklahoma. Darlene married Jay PEEVEY. Lewis Dale EDELEN. Lewis married Barbara Joyce JONES on 26 Jun 1960. 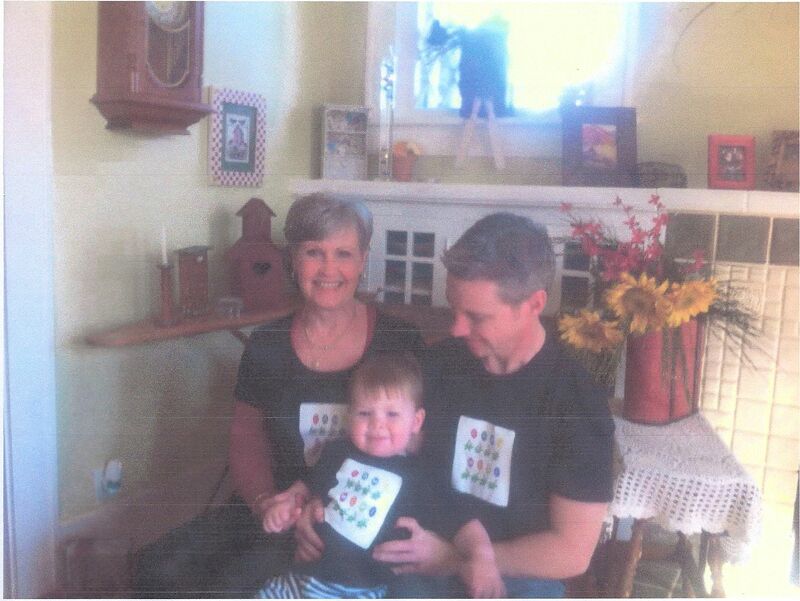 Barbara Joyce JONES [Parents] was born on 23 Mar 1942 in Durant, Bryan, Oklahoma. Barbara married Lewis Dale EDELEN on 26 Jun 1960. Jerry Lee JONES [Parents] was born on 23 Nov 1946 in Durant, Bryan, Oklahoma. Jerry married Jeri Ann O'NEIL on 25 Jun 1966. Jeri Ann O'NEIL. Jeri married Jerry Lee JONES on 25 Jun 1966. Ricky Lynn JONES [Parents] was born on 6 May 1954 in Durant, Bryan, Oklahoma. Ricky married Kathryn Bernadine MARTIN. Kathryn Bernadine MARTIN. Kathryn married Ricky Lynn JONES. James Thomas SPEAKS was born in Jan 1857 in , White, Arkansas. He died in 1918 in Charles, Maryland. James married Mary Ida RAVIA in 1892 in Indian Territory, , Payne, Oklahoma. Mary Ida RAVIA was born on 30 Jun 1867 in , , Oklahoma. She died in 1 Feb 1952 or 11 Feb 1952 in , , Oklahoma. Mary married James Thomas SPEAKS in 1892 in Indian Territory, , Payne, Oklahoma. F i Ida Mae SPEAKS was born on 9 Feb 1909. She died in 1993. Frank Travis JONES "Sr" [Parents] was born on 14 Oct 1890 in Dexter, Cooke, Texas. He died on 28 Nov 1960 in Coleman, Johnston, Oklahoma. He was buried in Coleman Cemetery, Coleman, Johnston, Oklahoma. Frank married Florence May BAZEMORE on 9 Oct 1910 in , Pontotoc, Oklahoma. The marriage ended in divorce. Florence May BAZEMORE [Parents] was born on 21 Nov 1894 in , , Oklahoma. She died on 29 Jun 1976. She was buried in Memorial Park Cemetery, W. Ada, Pontotoc, Oklahoma. 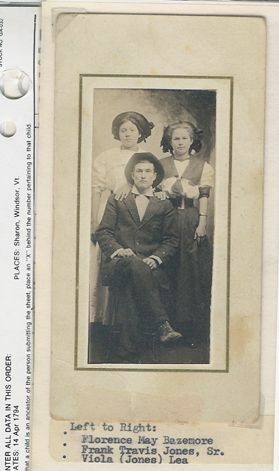 Florence married Frank Travis JONES "Sr" on 9 Oct 1910 in , Pontotoc, Oklahoma. The marriage ended in divorce. 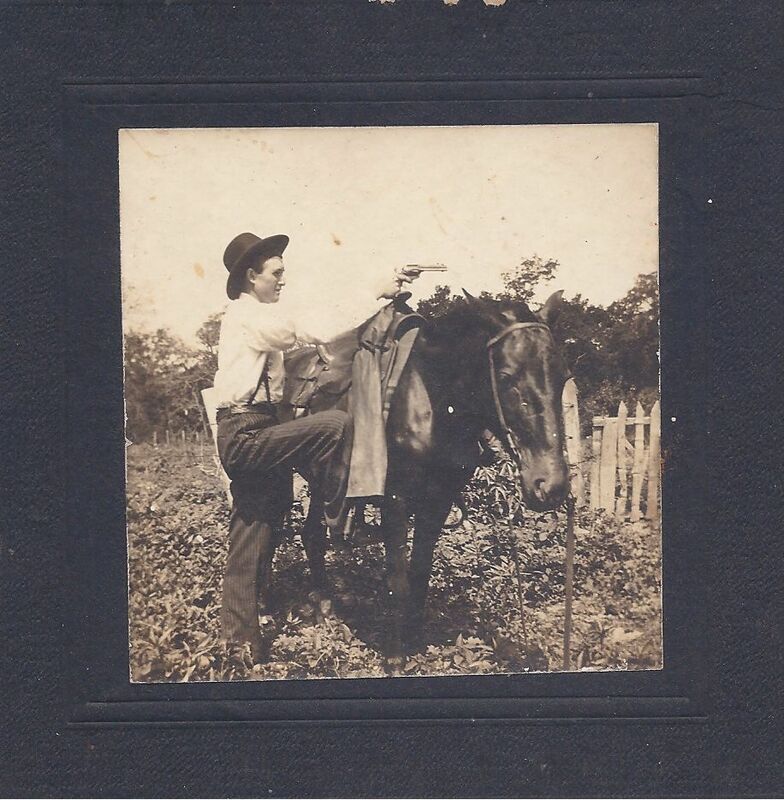 Frank Travis JONES "Sr" [Parents] was born on 14 Oct 1890 in Dexter, Cooke, Texas. He died on 28 Nov 1960 in Coleman, Johnston, Oklahoma. He was buried in Coleman Cemetery, Coleman, Johnston, Oklahoma. Frank married Callie Ivory HARRIS on 19 Aug 1914 in Tishomingo, Johnston, Oklahoma. Callie Ivory HARRIS [Parents] was born on 27 Feb 1896 in Wapanuka, Johnston, Oklahoma. She died on 28 Jun 1969 in Coleman, Johnston, Oklahoma. She was buried in Coleman Cemetery, Johnston, Oklahoma. Callie married Frank Travis JONES "Sr" on 19 Aug 1914 in Tishomingo, Johnston, Oklahoma. M i Roy Lee JONES was born on 28 Jun 1915. He died on 26 Feb 1983. M ii Charles Edward "Eddie" JONES was born on 9 Mar 1919. He died on 24 Jan 1996. J. L. JONES was born on 19 Sep 1921 in Coleman, Johnston, Oklahoma. He died on 27 Jan 1923 in Coleman, Johnston, Oklahoma. He was buried in Coleman Cemetery, Johnston, Oklahoma. F iv Mary Ruth JONES was born on 6 Mar 1928. F v Imogene Gay "Jeanie" JONES was born on 20 Dec 1931. M vi Frank Travis JONES "Jr" was born on 15 Dec 1937. He died on 22 Apr 1976. John Byrd NICHOLS [Parents] was born on 8 May 1817 in Gordonville, Smith, Tennessee. He died on 27 Jul 1902 in , Smith, Tennessee. John married Felicia Hughes SIMMONS about 1840. Felicia Hughes SIMMONS [Parents] was born on 3 Jul 1816 in Buffalo Valley, Putnam, Tennessee. Felicia married John Byrd NICHOLS about 1840. F i Felicia Jane NICHOLS was born on 18 Mar 1841. She died on 16 Apr 1870. Wiley WALTERS was born in 1891 in , Fayette, Alabama. Wiley married Mexie Haseltine OSWALT on 2 Nov 1913 in , Fayette, Alabama. 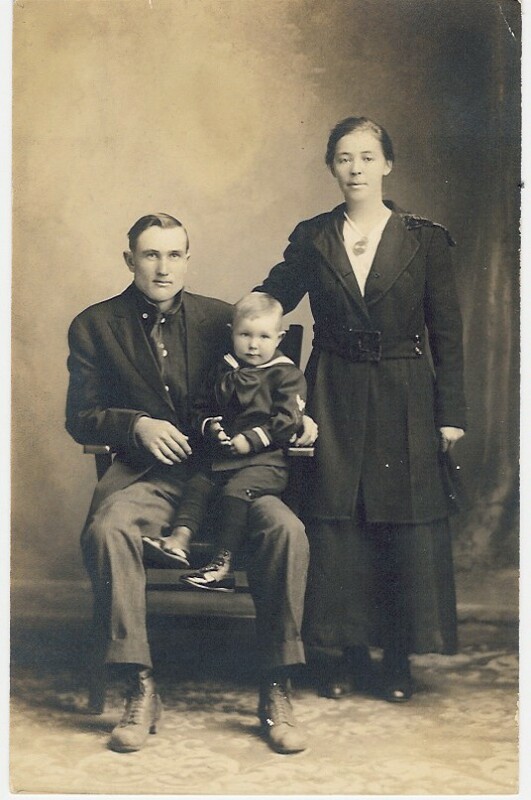 Mexie Haseltine OSWALT [Parents] was born on 23 May 1895 in , Fayette, Alabama. She died on 17 Jan 1917. She was buried in Concord Baptist Cemetery, , Alabama. Mexie married Wiley WALTERS on 2 Nov 1913 in , Fayette, Alabama.